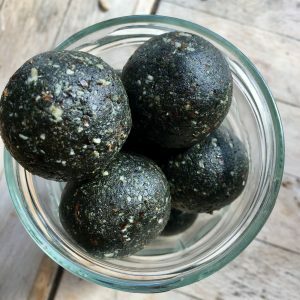 Protein balls are very popular at the moment, as they are a great healthy alternative to a midday snack, an afternoon pick me up or a very quick breakfast. You can actually buy a variety of brands now, but I always think they are so much better if you make them for yourself. Firstly because a lot of companies are adding extra (not so healthy) ingredients to increase shelf life, secondly, most of them are overpriced, and lastly because they only take 30 minutes to make and in that 30 minutes you get at least 5 portions, if not more. I am going to share the recipe of my most recent creation, but to be honest, once you get the hang of it, you can start experimenting with the ingredients and come up with your own variations. You will need to choose high protein ingredients like seeds and nuts, you can add protein powder of your choice too, and you always need something that binds your ingredients together. For this purpose I either use dates, or if I want to keep it lower carb; peanut butter, almond butter or coconut oil. If you are using dates, whole nuts and seeds then you will also need a food processor to blend the ingredients. I often like to add super food powders as well, which can increase the protein content as well as the nutritional value of balls. 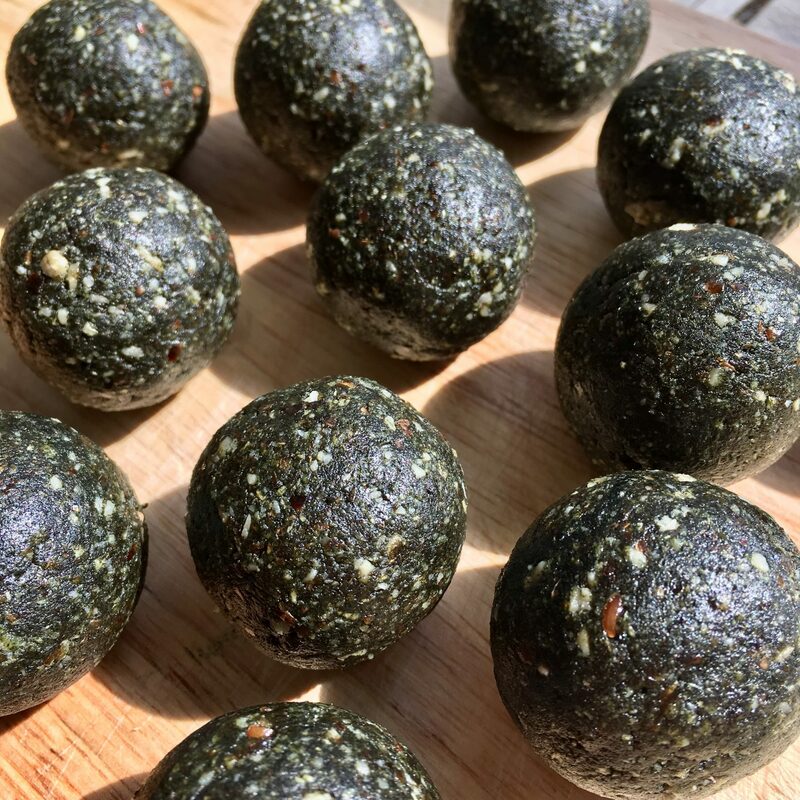 For these green protein balls I used ground almonds, ground flaxseeds, sunflower seeds, desiccated coconut, dates, spirulina powder, vanilla extract, a drop of fruit syrup and Himalayan salt. 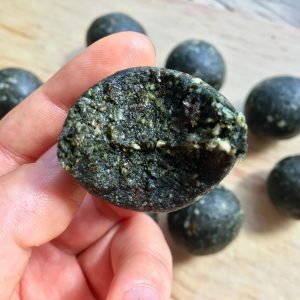 The spirulina powder gives the balls their green colour and is extremely nutritious. It is a type of blue-green algae that grows in both salty and fresh water. 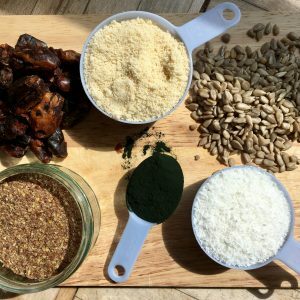 It is one of the most nutrient-dense food in the world and has powerful antioxidant and anti-inflammatory properties, and its protein is excellent, containing all essential amino acids. 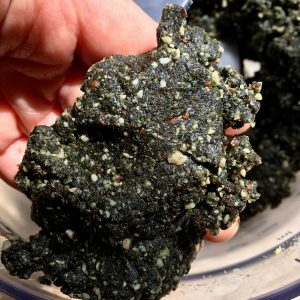 At 55-75% protein, Spirulina is one of the best vegetarian protein sources around. Despite their small size, sunflower seeds are a dense source of vitamins and minerals and essential oils. Sunflower seeds contain two nutrients that promote cardiovascular health — vitamin E and folate. They are a great source of magnesium, therefore it promotes healthy mood, heart, brain and muscles. Flaxseeds can help you improve digestion, give you clear skin, lower cholesterol, reduce sugar cravings, balance hormones, fight cancer and promote weight loss. Each tablespoon of ground flaxseed contains about 1.8 grams of plant omega-3s, the “good” fats that have been shown to have heart-healthy effects. The strong fibre content of flaxseeds—including their mucilaginous fibre— can improve intestinal absorption of nutrients. Flaxseed fibres also help digestion. Wonderfully delicious, dates are one of the most popular fruits packed with an impressive list of phytonutrients, vitamins, and minerals that are essential for normal growth, development, and overall well-being. The fruit is rich in dietary fibre, which prevents LDL cholesterol absorption in the gut. They are an excellent source of iron, potassium, calcium, manganese and magnesium. Almonds contain lots of healthy fats, fibre, protein, magnesium and vitamin E. The health benefits of almonds include lower blood sugar levels, reduced blood pressure and lower cholesterol levels. They can also reduce hunger and promote weight loss. As you can see these little balls can provide you with a lot of nutrients, whilst they satisfy your cravings for snacks. 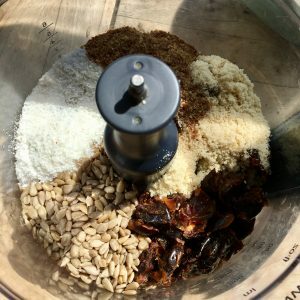 Start with processing your sunflower seeds in the food processor. Once it is ground, add all other ingredients except the dates into your food processor and start blending. When everything is blended start adding the dates one by one, and keep processing the mixture until it’s all very well combined and the mixture has a sticky texture that is easy to roll. All that’s left to do is roll into balls and enjoy!